Through the Library's "Group Pass" account with the New York Times, Library cardholders can enjoy free and unlimited access to the New York Times website. Access is free, but first-time users will need to create an account for the New York Times website and if you are outside a library location you will need a libary card number to access this resource. 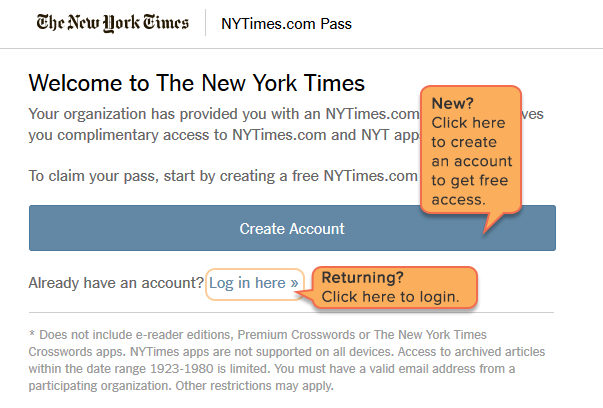 Click the "create an account" link, enter your email address, and create your New York Times password. Once you complete this step, a group pass will be issued to you. Enjoy unlimited access to the New York Times for 72 hours! Passes can be renewed as often as you like. Just repeat the steps above to renew. Returning visitors whose passes have expired will need to activate a new pass. To do so, visit the Library's link to the New York Times and click the "Log In to Continue" button. You'll be prompted to enter your email address and New York Times password. Visit the Library's link to the New York Times on a Library computer or on your own device connected to Library WiFi. While on Library WiFi or a Library device, you will have unlimited access to the New York Times website. Make sure you login to avoid any paywall messages. You can go directly to their site or use their app while on the Library network. Retain access once you leave by getting a group pass, described above for Outside the Library access. Click the "Login" link in the upper right-hand corner of the New York Times homepage. Next, click the "Sign Up" link, enter your email address, and create your New York Times password. Enjoy! No library card? Get access now by getting an eCard. eCards can be turned into real cards by visiting any library location. Click below for full details and to apply now.